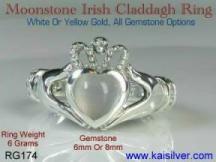 A Claddagh engagement ring would be one of the most meaningful engagement rings that you will ever find. This Irish ring has a rich cultural background that goes back to over 300 years in history. Despite the fact that the first Claddagh ring was made in Ireland, the ring has a lot of relevance to all of us no matter which part of the globe we are in. The ring is an outstanding symbol of love, friendship and loyalty and the harsh conditions in which the first Irish claddagh ring was made, make it all the more suitable for an engagement ring. 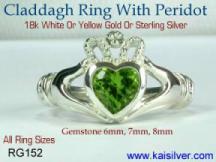 Kaisilver is the best source for your yellow or white gold engagement claddagh ring because, we create the world's best rendition of this Irish legend. The RG186 is a gorgeous claddagh engagement ring with five diamonds studded in the crown. If you find the ring to be too flashy for your liking, consider the RG141 claddagh diamond enagagement ring (shown lower below). The RG141 has just three diamonds in the crown giving it a more subtle glitter. Both the rings are available in 14k or 18k white or yellow gold with a gemstone of your choice. 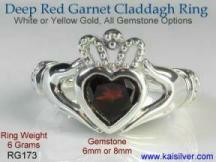 The engagement claddagh ring RG186 shown on this page is a premium version of the Irish claddagh ring from Kaisilver. 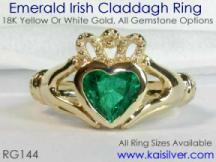 All our Irish claddagh engagement rings are completely custom made and available with all gemstone options. You can also choose from 14k or 18k white or yellow gold and the two tone gold option that combines white and yellow gold in the same ring, is also available at no extra charge. Each ring is completely custom made and worked on by some of the world's finest craftsmen. We do not mass produce merchandise and all design modifications are allowed. Kaisilver is the world's largest online provider of high end custom jewelry and has direct and preferential access to over 200 million carats of gemstones. Our jewelry is produced by over 3,500 skilled craftsmen and artisans. Seven top notch designers from five nations work on all our jewelry designs. This claddagh engagement ring retains all the features of the original claddagh ring that was first made over 300 years ago. We have turned this stunning ring into a high end jewel with flawless craftsmanship and handfinishing. All gemstones are handpicked and custom cut by experts and we do not believe in 'close out' and 'blow out' gimmicks where, low quality gemstones are set in lightweight jewelry with substandard craftsmanship. The claddagh engagement ring has an extremely touching story behind it. Claddagh is the name of a village in Ireland, this village has now changed with modernisation destroying most of it's natural charm and beauty. However the story of the claddagh ring takes us back in time by over 300 years when the claddagh village was a tiny finshing village with immense natural beauty. In this village lived a fisherman by the name of Robert Joyce. One day, the boat that Robert Joyce was sailing in was attacked by pirates and they captured all the occupants of the boat. As was common in those days, the captives were sold as slaves and Robert Joyce was sold to work as a slave with a wealthy goldsmith. Robert worked for his master but never forgot his beloved who lived in the tiny claddagh village. He soon learnt the trade from his master and during this time worked on a ring for his beloved. Even the harsh conditions in which he spent his tenure as a slave never made him forget his beloved. A few years later, Robert was released from slavery and went back to his fishing village. He then presented the ring that he had made to his beloved and the couple were soon married. 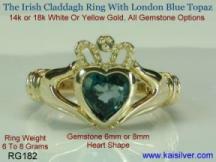 This ring was to become one of history's most meaningful jewels and came to be known as the now famous claddagh ring. This version of the claddagh ring story is the most believed narration of the ring. The claddagh ring has some very meaningful features and the story of the claddagh ring adds to the significance of this Irish ring. The heart of the ring denotes love, the hands that hold the heart show friendship and togetherness. Finally, the crown depicts loyalty which is a necessity in married life too. The claddagh ring is also referred to as the 'friendship ring' or the 'heart and hands ring' and belongs to a group of rings called the 'faith rings'. 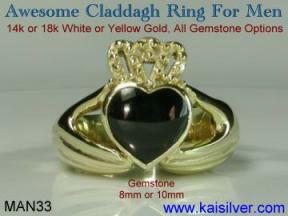 Why Get Your Claddagh Engagement Ring From Kaisilver? 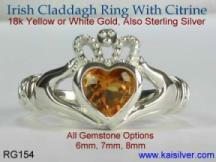 Kaisilver engagament claddagh rings have a well researched design. Our designers and craftsmen did an intense research into the origin, meaning and significance of the claddagh ring. 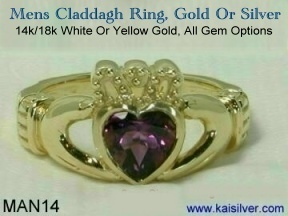 Your kaisilver claddagh ring retains all the features of the original ring that was first made over 300 years ago. 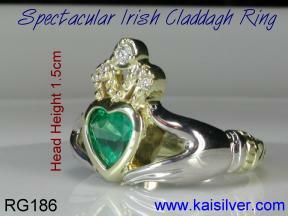 You can be sure that every Irish claddagh engagement ring will have the finest craftsmanship that you will ever find. Extremely skilled craftsmen work on each ring and we do not mass produce merchandise. Flawless handfinishing is provided in the final phase of production. We follow some of the strictest quality control standards in the industry and ensure that your claddagh ring is a true high end jewel. All our jewelry has a healthy gold weight and this adds to the longterm durability of your ring. A good gold weight for your claddagh engagement ring means that it will not bend and twist easily and also provides a firm setting for the gemstone and diamonds. The weight of our jewelry is around 50% to 60% more as compared to what others would provide for similar designs. This does add to the price tag but would soon repay itself by savings on frequent and expensive repairs and modifications. 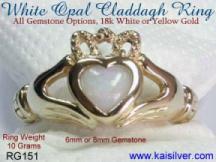 You have a complete range of gold options for your Irish claddagh engagement ring. The ring can be ordered in 14k or 18k white or yellow gold and we also provide the two tone gold option at no additional charge. The two tone claddagh ring combines white and yellow gold in the same ring. For rings that have to be worn very often, 14k gold is a better choice because of it's hardness. 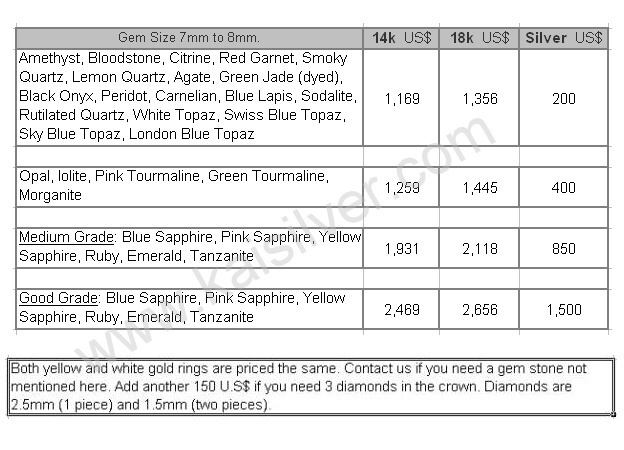 Email us at sales@kaisilver.com if you are not sure about which gold option is suitable for you. We will be glad to guide you in making the right decision. We are directly networked to leading jewelry and gemstone producers in Thailand and five other nations. This gigantic network provides us with preferential access to over 200 million carats of gemstones. 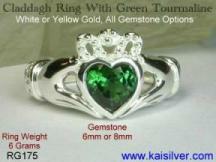 All our jewelry including these claddagh engagement rings are available with all gemstone options. Every gemstone is handpicked and custom cut by experts and you do not have to limit yourself to the gemstones that you see on our website. Just let us know which gemstone you need and we will procure it for you. With the unlimited choice of gem stones for your claddagh ring, choose your birth stone and create a stunning engagement birthstone cladagh ring. It has been believed since many decades that a gemstone represents every month of the year in which a person is born. Wearing a jewel with your birthstone is believed to bring you good health, wealth and fortune. You can refer to the above birth stone charts and choose the birthstone of your choice. All gemstones will be handpicked and custom cut by our skilled craftsmen and you can take the advice of our experts if you have any doubts or queries. 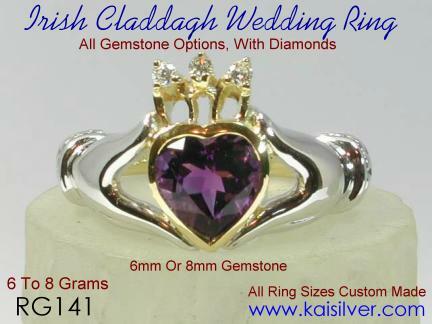 Since each claddagh engagement ring (and infact all Kaisilver jewelry) is completely custom made we offer a high degree of flexibility that no other seller can match. Besides the choice of gold and unlimited choice of gemstones, you can also ask for any design modification that you need. All ring sizes are available and you can even send us images of your favourite designs for us to custom make. 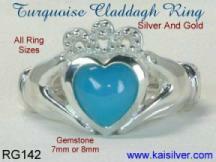 You should also read some of the rave reviews about our Claddagh rings. 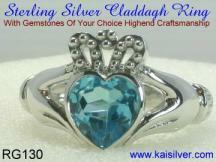 The buyer response to Kaisilver claddagh rings has been truly stupendous. Buyer Comment I just received my ring today, and it is lovely. I must admit though that it is much larger than I thought it would be...lol I do really like the ring a lot, and I apprecaite your patience and care while making it. The diamonds look amazing in the crown, and the setting isn't going anywhere. Thanks again, and have a good one. Thank you, Ms. Michelle Talmon, U.S. This version of our claddagh engagement ring is a premium version with added gold weight and diamonds in the crown. The ring as shown in the image has a high grade emerald gemstone of size 7mm to 8mm. The ring also has an upgraded gold weight of 10gms to 12gms and this adds to the durability of the ring, allowing much better mounting for the many diamonds included in the crown. The diamonds in this engagement claddagh ring have also been increased from 3 diamonds to 5 diamonds. The diamonds are one of size 2.5mm round, 2 of size 2mm round and 2 of size 1.5mm round. You will also notice the different crown designs for our claddagh rings and you can select the crown design of your choice. The price quoted below is for the version without the diamonds, please add another 200 U.S$ to the below prices if you need the diamonds in the crown. You can also order the same ring without diamonds in the crown. Please email us at sales@kaisilver.com with any questions or doubts that you might have and we will be glad to clear them for you. Please send us your questions and doubts at sales@kaisilver.com and we will provide complete answers and explanations to ensure that you make a well informed decision. White gold and yellow gold is priced the same. In the case of sterling silver jewelry, no rhodium or other plating is done. While gold or rhodium plating can be provided for silver jewelry at no additional charge, please remember that all plating will wear off with time. Both silver and gold jewelry has the same high end craftsmanship. Our team of experts will let you know if your ring size requires a weight that is more than mentioned. Please send us your questions and doubts at sales@kaisilver.com and we will provide complete answers and explanations to ensure that you make a well informed decision. This ring has now been upgraded to a weight of 20 grams. A sturdy and durable man claddagh ring in 14k or 18k gold with a gem stone of your choice. This design is very suitable for a gemstone size of upto 8mm. Very good gold weight and a firm gemstone mounting make this ring a great choice for today's active men. 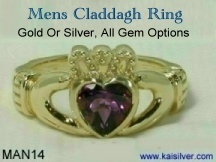 ...click for details This is another great design for a gent's claddagh ring. Once again, a very healthy gold weight of around 20 grams to 25 grams ensures that the ring has a high durability. Suitable for gem stone sizes that are around 10mm. The ring is shown here with an onyx gemstone but you can always select the gemstone that you prefer. Kaisilver is the world's largest online provider of high end custom jewelry. We do not mass produce merchandise and each piece is worked on by some of the finest craftsmen and artisans. We provide high end craftsmanship for both sterling silver and gold jewelry, flawless handfinishing is done in the final phase of production. We also created the the world's first high end collection of gents rings and remain the leader in this market segment. Our intense research into every design that we make ensures that, the Kaisilver claddagh ring is the best rendition of this traditional Irish ring. We are directly networked to all the leading gemstone and jewelry producers in Thailand and five other nations. This massive setup gives us a huge base of around 3,500 skilled craftsmen and artisans. We also have preferential access to over 200 million carats of quality gemstones and each gemstone is handpicked and custom cut by our gemstone experts. We do not indulge in gimmicks like 'close outs' and 'blow outs' where low quality gemstones are haphazardly set in light weight gold or silver mountings. This junk jewelry with substandard craftsmanship is monolpolized by the big department stores, discount stores and other outlets of television shopping. Our buyers include business professionals, members of the U.S and U.K armed forces, TV news readers, fashion models, doctors, engineers, resort and hotel owners and other individuals from almost all walks of life. Over 80% of our orders are repeat orders from highly satisfied buyers and almost all buyers are introduced to Kaisilver through other buyers. You can read some of our buyer feedback at this link click for buyer testimonials and you will realize why more than 5,000 buyers from 17 nations shop online at Kaisilver for all their gemstone and jewelry requirements. We do not employ smart talking sales staff to pressurise you into making an impulse buy. All queries and emails are answered by a team of gemstone and jewelry experts. You can email us at sales@kaisilver.com with all your questions even if, the final order does not come to us. We believe in providing you with complete information and then allowing you to make a well informed decision. You will be pleasantly surprised at the calm pace with which you can browse and order your jewelry from our website. The loud 'buy now', 'pay here' and 'limited time offer' gimmicks are all missing. We urge you to clear all queries and doubts before even thinking of buying from us. You can email us at sales@kaisilver.com with all your requirements and we will guide you step by step, into making the right decision. You are under no obligation or pressure to place your order with us and a team of Kaisilver jewelry and gemstone experts will answer all emails. We continue to strive to bring back the human touch to online selling and our objective is to ensure that you make a well informed decision, before spending your hard earned money. Payment can be made through paypal or Western Union Money Transfer. Our email for paypal is INFO@KAISILVER.COM and you can register for a free paypal account at www.paypal.com which is one of the most popular modes for online payments. In recent weeks many buyers have requested to make payments through Western Union Money Transfers. This is because they are put off with the excessive amount of information to be disclosed, to register for a paypal account. Paypal maintains that the information collected is used to ensure high security standards. However, we do accept Western Union Money Transfers and you can let us know if you prefer this mode of payment. Visit the Western Union website at www.westernunion.com and you can look for an agent near you. If you are in the U.S or U.K you can transfer money online through Western Union and the website provides complete information regarding this. Shipping charges are 25 U.S$ worldwide and your merchandise will ship within 4 to 5 weeks of order confirmation and receipt of payment. We need this time due to the immense amount of skilled craftsmanship provided for each jewel. At Kaisilver all custom jewelry orders are handled by a team of very skilled craftsmen. The high quality handfinishing provided to each jewel is a time consuming process but, is also the only way that high end jewelry can be made. Every gemstone is handpicked by experts and custom cut, we do not use low quality gems like many other jewellers do. We follow some of the strictest quality control standards in the industry and will never compromise on quality. If you need your Kaisilver custom jewellry in a particular time schedule, please ensure that you order well in advance. We will never do a hurried job in a desperate bid to get your order. Subscribe To The FREE Kaisilver Newsletter. The Kaisilver Jewelry Newsletter is one of the most respected jewelry and gemstone newsletters. Each volume of our newsletter provides invaluable information in a simple, frank and straightforward manner. We cover topics that no other seller would dare disclose for fear of losing buyers. The information in our jewelry newsletter is not high gloss sales talk and consists of information, tips and suggestions that are collected by our team of experts. The Kaisilver mailing list is independently maintained by bravenet.org and every email address added here passes through a double confirmation process. You can unscubscribe to our newsletter at any time by choosing 'unsubscribe' from the box shown below. The details that you enter here are passed on to bravenet.org and you will receive an email request to re-confirm your subscription to our jewelry newsletter. It is only after this confirmation that you are added to the mailing list. An engagement is meant to symbolize a decision or commitment between two individuals. The claddagh ring with it's tremendous meaning and significance is ideally suited for an engagement ring. There is a growing trend to wear a pair of engagement rings and as we have seen earlier, claddagh rings can be worn by ladies and men. 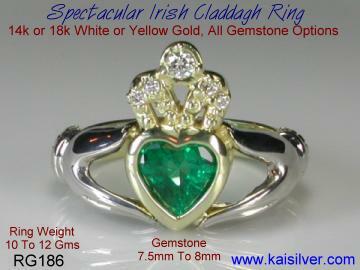 A pair of claddagh engagement rings is therefore a very good option that you can consider. With the wide range of gemstone options that we provide, consider choosing a birthstone for your engagement claddagh ring. It is also quite popular to exchange birthstones in special occassion rings like wedding and engagement rings. 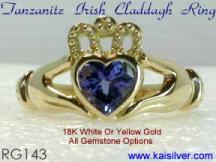 The lady's claddagh engagement ring will have the birthstone of the man and vice versa. A birthstone engagement claddagh ring enhances the meaning and significance of an engagement ring. Another suggestion is to choose an etching inside the band of the ring. This could be something like a name or short message, you could ask for a date to be etched inside the band of your claddagh engagement ring. We provide this service at no extra charge to you and our experts will let you know the size of the message (that would be readable) depending on the ring size. Email us at sales@kaisilver.com and we will be glad to answer any more queries or doubts that you have. Our team of experts welcome all questions related to jewelry and gemstones and you are under no obligation to purchase anything from us. All the information on this website is the sole property of www.kaisilver.com and may not be copied or published without our explicit permission. We are not interested in any affiliate programs and are also not interested in any advertising options, so please exclude us from related communication.